This dish was time-consuming -but special, pretty, and delicious. Most vegetarian enchiladas are filled with cheese or beans. These are filled with a queso fresco, red onion and cilantro filling – BUT then they are LADEN with toppings. I LOVE toppings! 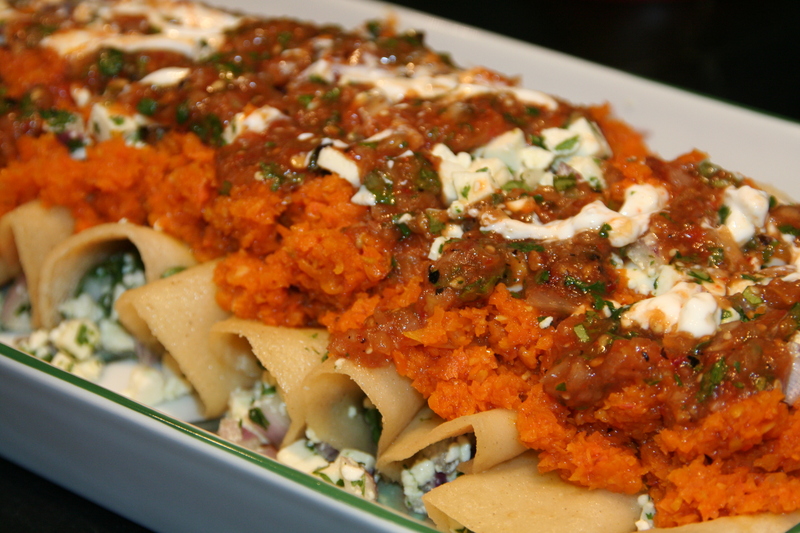 The first is a sofrito made with slow-cooked carrots, onions, tomatoes, and garlic, then they’re sprinkled with the cheese filling, then topped with Smoky Tomatillo Salsa, and finally sour cream. Every layer of flavor added to this dish. GREAT! This recipe is from Food and Wine, contributed by Josef Centeno. I usually steam my tortillas in the microwave to make them more pliable and warm. I did follow the recipe and warmed them in oil – tasty – but I used less than suggested. I also used a Vidalia onion and added more garlic to the sofrito -YUM! 1. Preheat the oven to 225°. In a food processor, pulse the carrots, onion and garlic until very finely chopped. Scrape the mixture into a medium bowl. Add the tomatoes to the food processor and pulse until nearly smooth. 2. In a medium, deep ovenproof skillet, heat 2 tablespoons of the olive oil until shimmering. Add the carrot mixture and a generous pinch of salt and cook over moderate heat, stirring occasionally, until softened slightly and nearly dry, 5 to 7 minutes. Add the tomato puree and cook, stirring occasionally, until most of the liquid has evaporated, 5 minutes. Stir in the remaining 6 tablespoons of olive oil. Transfer the skillet to the oven and bake for 1 1/2 hours until the carrot sofrito is very soft. Season with salt, cover and keep warm over low heat, stirring occasionally. 3. In a medium bowl, toss the crumbled queso fresco with the cilantro and red onion. 4. In a small skillet, heat 1/4-inch to 1/2-inch of canola oil over moderately low heat. Add 1 tortilla to the skillet and cook until just pliable, about 20 seconds. Using tongs, transfer the tortilla to a baking sheet. Repeat with the remaining tortillas. 5. Working quickly, roll a scant 1/4 cup of the cheese mixture in each tortilla and arrange them on a large platter, seam side down. Spoon the hot sofrito over the enchiladas and scatter the remaining cheese mixture on top; drizzle some of the Smoky Tomatillo Salsa and crema over them and serve, passing additional salsa and crema at the table.